A design drawn with serious efforts to reduce overall costs in mind. Single chined,fibreglassed marine ply hulls are used with vacuum bagged ply/foam/ply bridgedeck, beam-bulkheads. Accommodations are 2 double berth cabins aft port and starboard and 2 single bunks and a toilet forward on port side. Galley is port hull centre, with saloon ,dinette and nav station on bridgedeck. The starboard hull has workshop at centre, with toilet, shower, and generator/washing machine room forward. Rig is simple single spreader type, and utilises a trough boom for mainsail stowage. A roller reefing/furling self tacking jib and rollaway removable screecher, with a gennaker (in stowing sock) complete the wardrobe for easy sail handling. 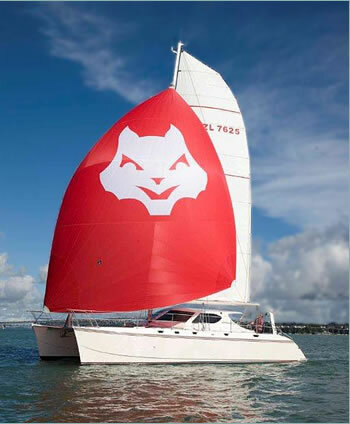 This catamaran has recently been put into MSA safe ship management, and is now certified for local charter work.